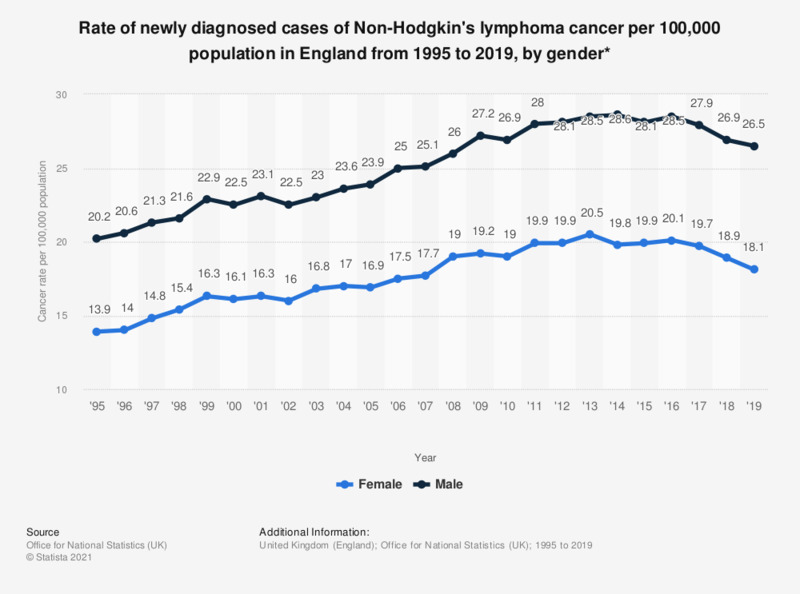 This statistic shows the rate of registrations of newly diagnosed cases of non-Hodgkin's lymphoma per 100,000 population in England from 1995 to 2016, by gender. Non-Hodgkin's lymphoma is a cancer of the blood, particularly the white blood cells or lymphatic system. In 2016, 28 males and 19.8 females per 100,000 population were registered as new diagnosed with Non-Hodgkin's lymphoma. While the rate of males registered as newly diagnosed with Non-Hodgkin's lymphoma decreased from 28.4 in 2014, the rate of females registered a newly diagnosed increased from 19.6.